"We really enjoyed the blog by Jamie Goldberg on Kitchens.com where she lists granite countertops, travertine floors, industrial style faucets and french door refrigerators as among her least favorite kitchen products! 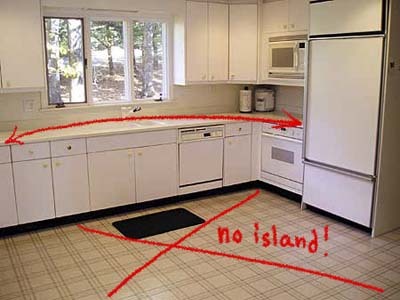 We thought we could add to this list of kitchen trends gone wrong and we bet you can too..."
Are These The Worst Kitchens In America? We think this kitchen could use some storage solutions...and maybe a new island? Just a thought. With the coordinating paper towels, we think this one could qualify for the "too much floral" category. And the pink tile? Wow! Oh no. Great faux-finishing intentions gone horribly awry.